The Economic and Financial Crimes Commission (EFCC) has re-arraigned a former governor of Katsina State, Mr Ibrahim Shema. The former governor was re-arraigned on Tuesday alongside three others before Justice Maikaita Bako of the Katsina State High Court on a 24-count amended charge. Other defendants are the Commissioner for Local Government and Chieftaincy Affairs, Sani Makana; a permanent secretary in the Ministry for Local Government Affairs, Lawal Rufai, and the Chairman of Association of Local Government of Nigeria (ALGON) in Katsina State, Ibrahim Dankaba. 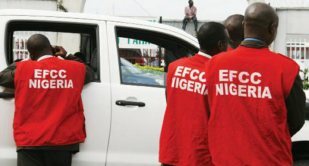 According to a statement by the EFCC spokesman, Wilson Uwujaren, the accused persons were first arraigned before the same court on February 21, 2017, for allegedly conniving to divert more than N11billion from the coffers of Katsina State while Mr Shema was governor. On the last adjourned date, the prosecution informed the court of its victory at the Supreme Court which dismissed the application of the former governor and his co-accused to stop their trial. The prosecution also informed the court of its decision to amend the charge. At the resumed hearing on April 10, 218, the amended charge was read to the accused persons and they all entered a plea of not guilty. In view of their plea, the prosecution counsel, Sam Ologunorisa, informed the court of his readiness to proceed to trial. Following no objection from the counsel representing the accused persons, the first prosecution witness, Ibrahim Dabo Bujawa entered the witness box. In his evidence, Bujawa who is a former Auditor General of Katsina State who retired in 2004, told the court that he chaired the Committee of Investigation of State and Local Government finances set up by the present governor of the state, Aminu Masari. In laying the foundation of his evidence, the witness explained how monies belonging to the Local Governments should legally be distributed. According to him, “ the functions of the JAAC Committee as provided by Katsina State Government is to meet on monthly basis in order to distribute funds sent from the Federation Account to some statutory bodies such as Local Government Service Commission, Primary Education Board, Local Government Pension Board and the two Emirate Councils of Katsina and Daura based on percentage allocated to them by the respective laws”. When asked if the first accused person, Shema, was at any time a member of the JAAC Committee, the witness answered no, stressing that a governor does not play any role in the distribution of the money. When asked as to whether his investigation committee had discharged its mandate, the witness replied in affirmative. He added that his investigation revealed that between 2007 and 2015 when Shema was governor, the JAAC Committee did not meet even once as provided by law. Bujawa was, however, cut short by the counsel representing the third accused, B.Y. Kura, who argued that the witness cannot give oral evidence on a written document. Kura stated that since there was investigation report already documented, such report should be tendered before anyone gives evidence about it. In view of the objection of the learned silk, the prosecution counsel asked the court for an adjournment to enable him to provide the report to the court. The case was adjourned till May 30 for the continuation of trial.